One of the crack dealers in Bourgois’s ethnography has amassed a small fortune (for the ghetto, at least,) and wants to “go honest.” So he uses his money to open a convenience store, but gets shut down by the authorities (state or local, I don’t recall which,) because his bathroom isn’t disabled-accessible. So he went back to selling crack. Salatin also complains about ADA compliance, particularly in the matter of parking lots (if he pours a few concrete spaces in his yard so customers can park at his farm and buy a few chickens, does he need to make a handicapped spot?) and bathrooms. Salatin’s principle complains, though, focused on food-regulation laws–What counts as organic? What is an approved butchering facility? What if you are only butchering five chickens and want to sell them to your neighbors? What, exactly, is “organic”? The amount of paperwork and legal compliance required to add a few organic potatoes or locally slaughtered chickens to such an operation are enormous. In chemistry, activation energy is a term introduced in 1889 by the Swedish scientist Svante Arrhenius to describe the minimum energy which must be available to a chemical system with potential reactants to result in a chemical reaction. 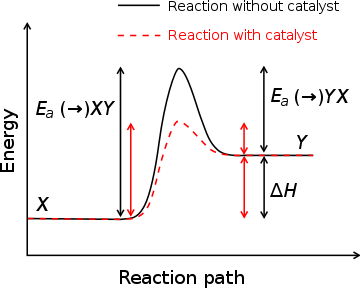 Activation energy may also be defined as the minimum energy required to start a chemical reaction. We can also think of activation energy in economic terms as the inputs necessary to start a business. Beyond the obvious physical requirements–if you want to produce shoes, you will need material for making shoes–we also have legal requirements. You cannot simply bake a bunch of cookies at home, walk outside, and start selling them. There are some serious food safety laws on the subject. Now to be clear, I value clean water, food, and medicines. I appreciate that my doctors are skilled. I don’t want to end up with brain-damage just because a local entrepreneur decided it was a good idea to dump old batteries into the drinking water, and I understand that disabled people need to pee just as much as everyone else. But at the same time, we need to make sure we are not putting in so much regulation that small-scale entrepreneurs are effectively shut out of the market, because the costs of compliance either make the economic activity completely unprofitable, or are just too high for someone trying to start a business to bear. This is OT. I have been reading your posts for a while now. I thought your post on energy input-output relationships for different farming methodologies was very insightful. I have recently published a Dystopian Hard Science Fiction Novel. One of the themes is that Robots serve Mankind faithfully resulting in humans becoming domesticated. This domestication process causes a profound shift in human relationships from monogamy to polygamy (similar to domesticated chicken), ultimately resulting in civilizational collapse. You can read this specific chapter: http://www.ramayana-3000.com/the-laws-of-man-chapter-12/ for more details on the domestication process. There is a paywall towards the end of the book but I can disable it for you if you share your email to shankar.sathiamurthi@gmail.com. You would get an email with instructions on bypassing the paywall. I would appreciate a book review from you. Thanks! Dr. Antony Sutton and John Taylor Gatto talk about how oligarchs/wealthy capitalists are always working for more regulation/socialism/governmental cooption of business. This regulation hurts their potential competitors coming from below/the potential disruptors, while they can dedicate a small portion of their total resources to lobbying/a compliance department full of lawyers/hiring former and future regulators through the revolving door. Remember the book Winston was reading in 1984? The Theory and Practice of Oligarchical Collectivism. We did a farm share for a couple of years, and it was basically “organic”, but it couldn’t be called an Organic (TM) farm, because something with the corn didn’t qualify. The corn still wasn’t conventional, and frankly tended to have a lot of bugs, especially for what we were paying… (And coming from the Midwest, New England grown produce is just plain disappointing… I can see why so many moved west to farm…) Plus, once I heard that my parents’ Midwestern farmshare delivered to their door (rather than having to line up in someone’s driveway once a week) and already cleaned off the vegetables, I decided I’d had enough “authenticity”. I don’t know why New Englanders think farm fresh produce has to still have dirt on it… It’s also true at farmer’s markets, with a few exceptions. There’s a scene in the beginning of Dreamland, an excellent nonfiction book about the opioid epidemic I’m reading, where a Mexican heroin dealer is coming into the U.S. There are also a group of manual laborers coming in at the same time. He sails right through customs, while they are closely questioned and then deported. Sometimes, it’s not just that life isn’t fair, it’s that it’s actually harder to do the right thing. Absolutely. These systems are set up, in so many ways, to punish people who try to obey the rules and reward people who just ignore them. Compare letting abnormal babies die from exposure vs. raising taxes on everyone else to support cripples. The West makes its rules as though the exceptions are all that matter. This is either unsustainable, or we reach technological Singularity and can spellcheck cripples into normies. I guess you’re in favor of setting the old and crippled adrift on ice floes as well. After all, why should we pay taxes so that they can suffer through their dementia-filled old age? Societies that kill their crippled babies do not usually produce enough non-crippled babies to survive. I don’t understand why we don’t scale the standard of care to the size of the operation. It’s a rather logical extension of the long tradition of fiduciaries and professional ethics, where people who are entrusted by others or who have expertise are judged by a higher standard. Properly legislated, could operate in the courts without any need for alphabet-soup agencies or volumes of regulations. Batteries in the water: there’s always going to be someone doing something stupid, and they should be punished. But in this hypothetical, I’m more concerned that the *professionals in charge of the water-supply* didn’t prevent or catch it, and that’s where my real anger would be directed. The phenomenon you’re talking about is often referred by contrasting the extensive margin of production with the intensive margin of production. You’ve probably heard about the “marginal cost” of producing an extra egg (for example), but there are actually two margins: one is the cost of producing one more egg at one of the existing poultry farms, and the other is the cost of opening up a whole new poultry farm.